"Clare Basin Upper Carboniferous Deepwater Sediments"
The cliffs of the Atlantic coastline and outer Shannon estuary of south Co. Clare (as displayed in the oval header above) are remarkable for their world-class exposures of Upper Carboniferous deep water, slope and delta deposits. These include spectacular examples of the fabrics formed by deepwater fan lobes, channels, and soft sediment deformation. As is illustrated in the the text below the high sea cliffs provide large 'reservoir-scale' slices through the various deposits. The exposures displayed in images throughout these pages are part of a well-trodden area for both academic and industry field parties seeking what are normally rare glimpses of how sedimentary rocks are arranged when they are displayed at 100's m to km length scales. In addition in recent years this area of Co. Clare has also become a test area for high resolution sequence stratigraphy whose concepts have far-reaching applications in the exploration and exploitation of hydrocarbons while providing an understanding how offshore basins fill. The Upper Carboniferous sections of the Co. Clare coast expose part of the fill of the Clare Basin (also known also as the Carboniferous Shannon Basin (Martinsen et al., 2000 and 2003; Pyles in Press)). The axis of this basin coincides with the Shannon estuary where it intersects the coasts of southern Co Clare and the northern Co Kerry. Prolonged subsidence in this area of western Ireland started in the early Carboniferous period. This subsidence was initiated by regional crustal stretching in the Lower Carboniferous that enabled the initial accumulation of a thick succession of limestones that are particularly well exposed in the Burren area of north Co. Clare. The character of limestone associated with this early phase of subsidence supports the contention that western Clare was the site of a platform-to-basin transition (Fig. 3). The area to the north marked a persistent shallow water platform but in the vicinity of the Shannon Estuary, the so-called Shannon Trough, the platform sloped southwards into a deeper water setting of what was an enclosed structural basin. By the end of the Lower Carboniferous, Kerry and probably South Clare were part of this deep water setting with limestone turbidites already accumulating on the basin floor. The succeeding Upper Carboniferous of the Clare Basin can thus be thought of as a successor basin that inherited much of its geometry from this earlier phase of subsidence and coincident bathymetry. Thus the boundary between shallow and deepwater Visean carbonates documented by Strogen et al. (1996) matches the margin of the basin defined by thickness data of the Ross Sandstone. This sandstone is thick above deepwater Visean carbonates and thin or nonexistent above the shallow water Visean carbonates. Thus the Ross Sandstone inherited a basin physiography that matches that of the Visean carbonates and the Iapetus Suture of McKerrow and Soper (1988), (Pyles, in press). During the Upper Carboniferous, Laurentia, Baltica, Western Europe and North Africa were welded together close to the paleo-equator (Elliott, 2000)(Fig. 5). The local climate was tropical though there was a glacial eustatic signal superimposed on the sedimentary fill. As indicated the depositional setting started by favoring carbonate accumulation but switched to clastic sediments deposition. This latter was tied to the continental collision which enabled access to new sediment source areas and sediment routeways. Much of Co. Clare, and the extension of the Clare Basin into counties Kerry and Limerick, was first blanketed by fine grained black shale deposits (the Clare shale Formation) that interpreted to represent deposition during a period of sediment starvation (Fig. 6, & 7). 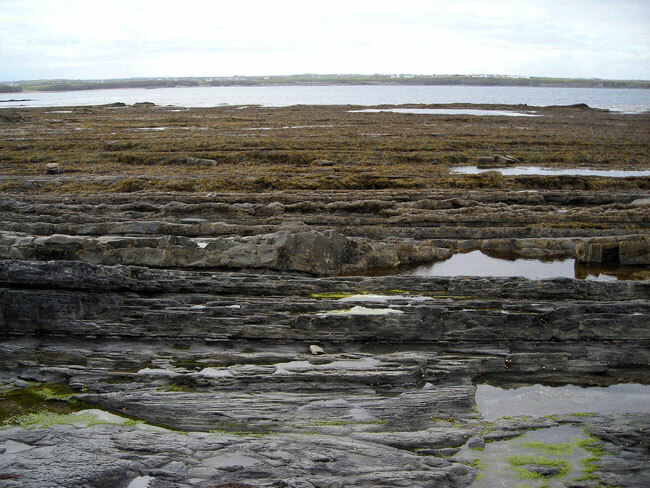 The area centered about the Shannon estuary then became the focus of deep water sandstone deposition (the Ross Sandstone Formation), whilst the original platform in North Clare remained starved of sediment and continued to accumulate a condensed blanket of black shale. The sandy sediment that accumulated in the Clare Basin at this time came from the southwest, and though we have little record of the coeval shallow water areas they probably lie somewhere out under the eastern Atlantic margin! 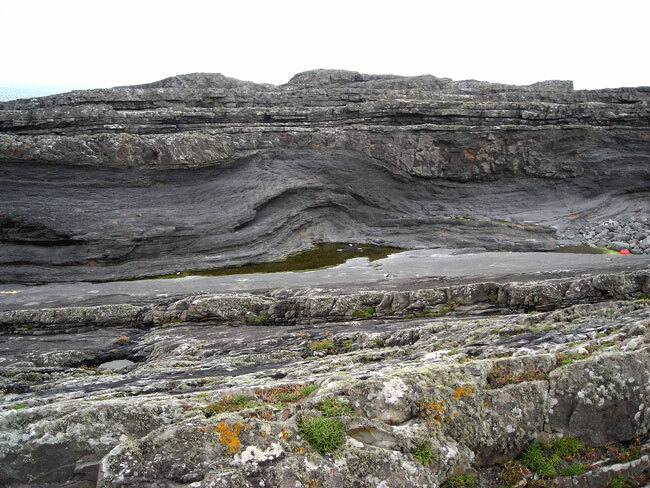 Interestingly this Upper Carboniferous basin filled gradually, becoming shallower upwards and the Ross Sandstone 'turbidites' are overlain by a thick succession of unstable slope deposits (the Gull Island Formation) and eventually by shallow-water delta deposits of the Central Clare Group (Fig. 4, 6, & 7). This vertical evolution of the depositional settings can simply be interpreted as a single progressive shoaling cycle with the sediments from these depositional settings superimposed vertically and probably originally laterally equivalent to each other. The rational for this interpretation follows a straightforward application of Walther's principle . However, it is equally plausible that the types of depositional setting present over and along the margin of the Clare Basin may have changed through time. In this case deposits of Central Clare Group type may never have been laterally equivalent to the Ross Sandstone Formation type rocks from a deeper water setting. Both these models, at the the least, should be kept in mind when trying to piece together how this basin filled. The total thickness of sedimentary rocks that accumulated in the Clare Basin is of the order of 1500 m. Sediment supply was from major (transcontinental?) river systems, probably draining distant source areas. The immediate hinterland was evidently tectonically inactive. These rivers carried a mixed load of clay, silt and sand grains, with little material coarser than medium sand grade arriving in the Clare basin depositional setting. The overall clay/silt/sand ratio is estimated to be 80:20. High sedimentation rates, the dominance of fine grained sediment and the draping of inherited slopes probably explains why we see such so much evidence for slope instability in the deposits. An analogous setting is displayed at the front of the modern Mississippi delta. The supply of sediment to the subsiding Clare Basin was clearly episodic. The succession was punctuted by many regional scale so called 'marine bands' or condensed sequences . These drapes of fine grained, organic-rich shale have a rich and condensed fauna of goniatites, bivalves, gastropods, crinoids, carbonaceous material and rare brachiopods. They are stratigraphically very important since they enable the succession to be sub divided and correlated at a resolution that is rarely attained elsewhere in the stratigraphic record (Fig 6). The marine bands are also laterally very extensive and enable long-range correlations. It is estimated that marine bands, each with their own distinctive fauna, recurred approximately every 65,000 years (Pyles, in press). Fig. 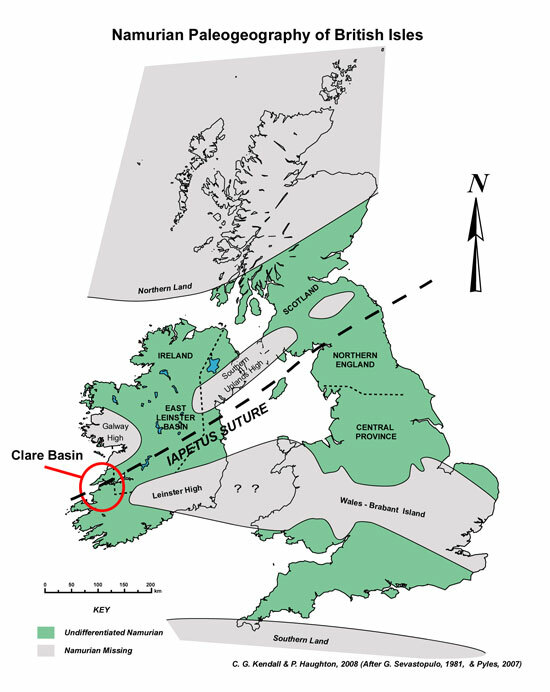 8 Paleogeographic interpretation of the depositional setting of the Namurian Geology of Clare Basin in Ireland and the Britain. 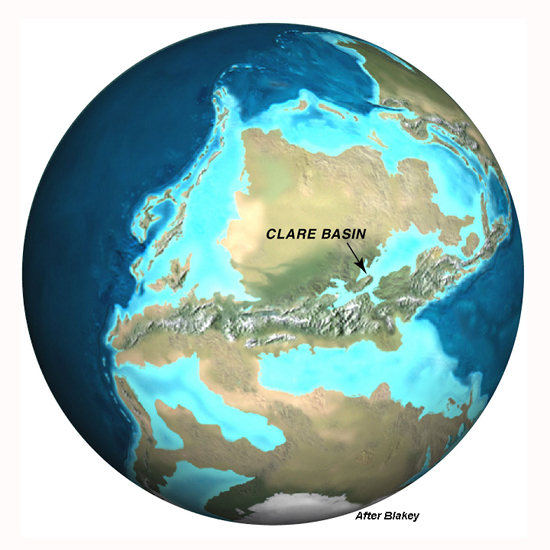 The Clare Basin was part of a network of Carboniferous basins foundered on stretched continental crust throughout NW Europe and including the British Isles (Fig 1). These basins were distant from and poorly connected to the main oceanic water bodies at the time (Fig 5), and as a result tides were insignificant and the water may even have been brackish, although this latter point is controversial. The discharge of large rivers into poorly connected marine basins may have resulted in dilution of the marine waters. Fully marine faunas are only encountered in the 'marine bands' and these almost certainly equate to types of rising sea level when marine water would have flooded into the basins. The Clare Basin, however, was of sufficient size and depth to promote significant deep water waves which approached the coastlines from the SE. These waves had an important role in distributing sediment carried to the delta fronts. Fig. 9 Namurian Geology of Shannon Estuary. The current stratigraphic nomenclature used for the Clare Basin was established by Rider (1974), who used the earlier biostratigraphical work of Hodson, (1954a, 1954b), and Hodson. & Lewarne, (1961) for the basic framework. He split the succession into two groups. The Shannon Group forms the base of the succession with deep water/slope deposits and while the Central Clare Group forms the overlying delta deposits that display a fundamental 'cyclicity' (Fig 6). The major stratigraphical units, from the base up, are briefly described below and their distribution in Co. Clare and south into Co. Kerry is shown in the maps of Figures 3 and 9. Fig. 10 Clare shale just north of Ballybunnion in Co Kerry on south side of Shannon Estuary. 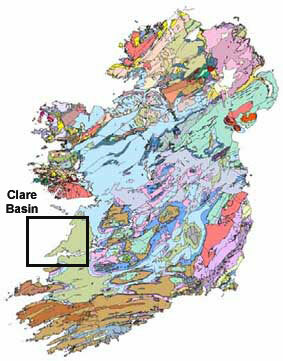 The Clare shale formation is up to 180 m thick around the Shannon Estuary, but is only 12 m thick in North Clare, where the early basin fill is missing (Figs 6). 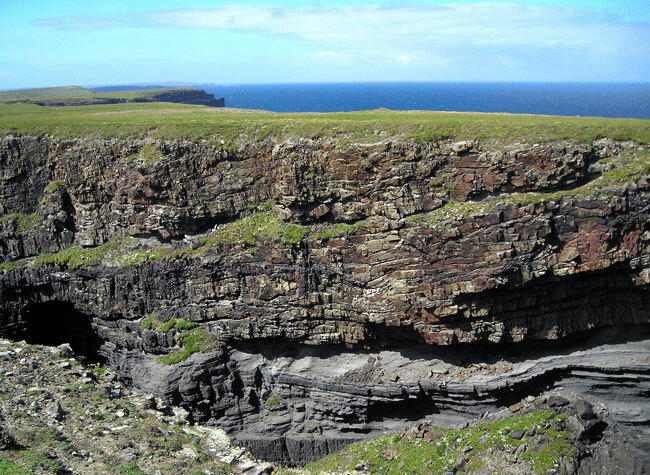 Although it extends across the whole basin, the Clare shale is not exposed in the area around Loop Head so we do not see the base of the overlying Ross Sandstone Formation. However there are exposures of this contact in the cliffs south of the Shannon Estuary just north of Ballybunion. The Clare shale Formation is dominated by black, laminated shales and contains a number of fossiliferous marine bands within it. The character of the Formation, and its stratigraphical position resting on earlier limestones, suggests the original limestone basin was flooded and there was slow suspension deposition of clays under deep, euxinic (oxygen-starved) conditions (Fig. 10). The startlingly extensive exposures of the Clare shale just north of Ballybunnion and south of Leck Point (Fig 10) capture its character in the cliffs at Kilcondy Point Cliff. Sandstone fills turbidite channels in the classic outcrops of the Ross Formation in Co. Clare. Lien et al 2003 determined flow directions from the localties whose photographic images are provided in the Galleries below. 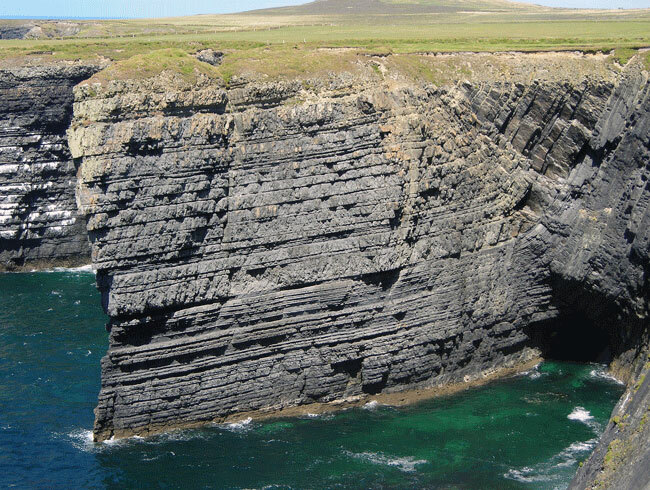 Lien et al 2003 examined the classic outcrops of the Ross formation, listed below, for Co. Clare at localities along the margins of Loop Head facing the Atlantic and the Shannon Estuary. Using the character of the stacking of channels and their sedimentary fill and interbedded sediments in these outcrops they were able determine the flow directions for the same stratigraphic interval. They interpreted these sedimentary bodies in terms of sinuous channel belts, shown in orange and yellow colors. Note that when Lien et al 2003 looked at a different stratigraphic interval, the sinuous channel belt model accommodates northwestward and northeastward flow directions for channels at Bridges of Ross and "Fisherman's Point". At yet another stratigraphic interval, the model accounts for northerly and northeasterly directions at Rinevilla and Cloonconeen. They took the bold step of linking the channels from these different localities. In this figure Lien et al 2003 outline their conceptual model for the sinuous channel belt and the basin floor with no channels shown in the figure above this one. 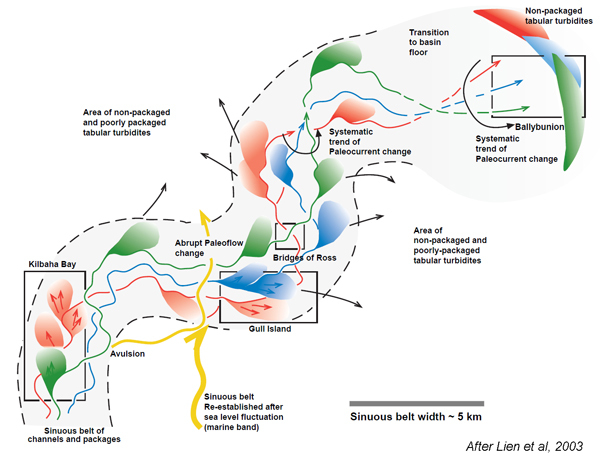 Lien et al 2003 provided the conceptual model shown in this figure of a sinuous channel belt, passing downstream into a basin floor with no channels. They show only three channels within the belt, numbered 1 through 3 and coloured red, blue and green. They interpret each channel to have overbank spill lobes at channel bends - showing some, but not all of these. 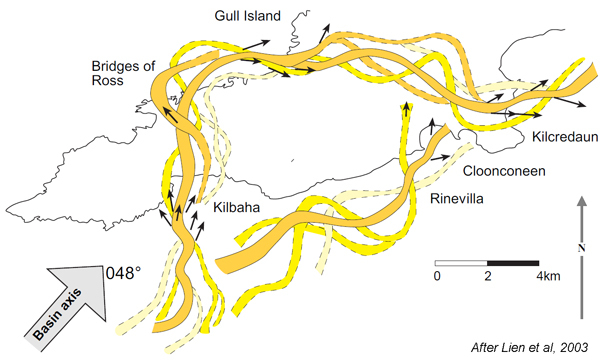 They idenditify northward flows and preponderance of spillover lobes (packages) for Kilbaha Bay, and eastward flows are suggested for Gull Island. Northwestward and northeastward flows are shown at Bridges of Ross, and unconfined tabular turbidites are shown at Ballybunion. They conclude that abrupt paleoflow changes may result from avulsion and/or changes in relative sea level associated with marine bands. In some of the sections they examined, prominent long term trends of paleoflow direction were shown in their Fig. 30 - these trends are indicated by curved arrows, and are interpreted to be the result of progressive downdip movement of sinuous channel belts, or progressive changes in the direction of supply to the basin floor (top right). Fig. 11 Ross Formation just north of Loop Head Lighthouse in Co Clare on north side of Shannon Estuary. The overlying Ross Sandstone Formation is thickest in the area of south Clare (c. 350m) and thins towards the north, east and south. 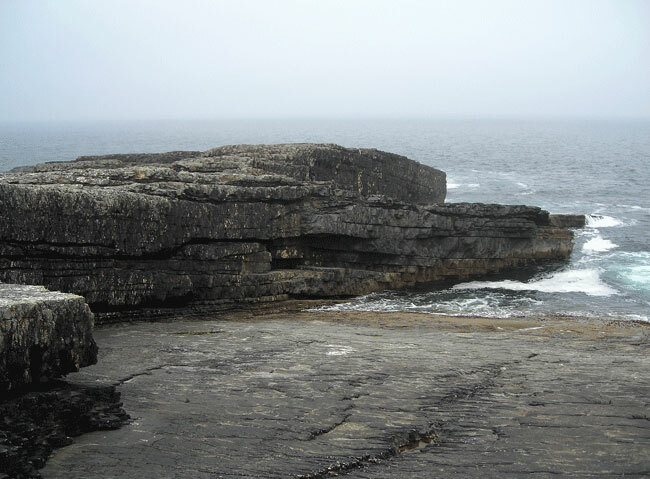 It is primarily composed of sandstones (around 65% at Loop Head (Fig 11, 12); Chapin et al. 1994), with subordinate interbedded shales and slumped horizons of mixed lithology. The sand is mostly fine to very fine grained, in dm to m-scale beds, many of which have a sheet geometry. These tend not to show systematic vertical trends, although laterally discontinuous channelized units (Figs. 13) and interbedded slumped and disturbed horizons are more common towards the top of the formation (Fig. 14). Fig. 12 Ross Formation on Loop Head just west of the Lighthouse in Co Clare on north side of Shannon Estuary. Fig. 13 A winged channel in the Ross Formation at Bridges of Ross Co Clare. Fig. 14 The major slumped layer of the Ross Formation at Bridges of Ross Co Clare. As indicated the base of the formation is seen at Ballybunnion, on the south side of the Shannon Estuary (Figs. 3, & 9), and it is marked by a gradual increase in the thickness and numbers of sandstone sheets sitting in black shales. A number of laterally extensive 'marine bands' are seen within the formation. The sandstone beds are interpreted as a turbidites dispersed from an unseen source lying to the southwest, and blanketing the deepest part of the basin floor as a fan or sheet system (Fig. 4, 7 & 11). A submarine high in north Clare prevented all but the youngest of the flows from depositing sand here (Figs. 3, & 7). The Ross Sandstone formation is transitional with the overlying Gull Island Formation, with the boundary placed at the widespread "Reticuloceras paucicrenulatum" marine band (Fig 6). 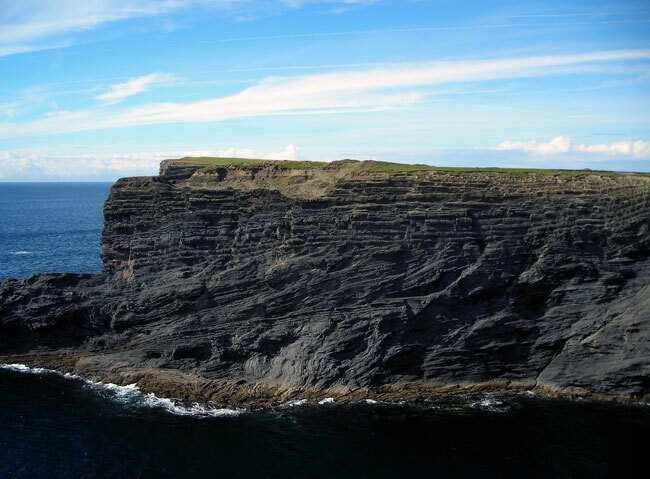 The Gull Island Formation reaches 550 m in the Loop Head region, but thins to c. 140 m in North Clare. The lower part of the formation contains siltstones interbedded with bundles of sheet sandstones (turbidites), whereas the upper section is primarily siltstones (Fig. 16). The main feature of this formation, however, is the extensive soft sediment deformation (growth faults and slump features; Fig. 16) which occurs within in it. It is interpreted as a fine grained, unstable (delta?) slope which prograded eastwards into the basin (Fig. 4). Fig. 16 The Gull Formation on the Clare coast just south of Fisherman's Point. The delta systems of the Central Clare Group transitionally overlie the Gull Island progradational slope system. The group has a maximum thickness of 900 m and can be broken down into five major cycles (or cyclothems) separated by prominent marine bands. Only the lower three cycles (Tullig (Fig. 18 & 19), Kilkee and Doonlicky) can be widely traced across the area and the web site focuses mainly with the lowest cycle; the Tullig cyclothem (Fig. 18). Each cyclothem broadly coarsens upwards and has been classically interpreted as a prograding delta system (Fig. 18), perhaps analogous to the modern Mississippi Delta); the deltas were fine grained, river-dominated with moderate wave-reworking of the delta front mouth bars (Fig. 19); the delta front slopes showing varying degrees of instability and this may partly relate to their position (with relatively stable shoal water deltas sitting on the shelf and unstable shelf margin deltas where rivers fed sediment to the shelf-slope break). Fig. 18. The Tulig Group. Each cyclothem typically commences with a silty succession reflecting the build out of unstable deep water delta fronts. Mouth bar sandstones are embedded in the top of these progradations; these can be up to 15 m thick and 2-3 km across. These are erosively cut by sandstone-dominated fluvial channels (Fig. 19). In the Tullig cyclothem, the sandstones are up to 35 m thick and are referred to as the Tullig Sandstone. Original interpretations of the cyclothems stressed autocyclic mechanisms, with the erosively based sandstones reflecting the advance of the distributive feeder channels of the delta top over the delta front with its mouth bars. However, discrepancies in the grain size of the sediment in the ‘channels’ and the delta front, the huge scale of the channel sandbodies (>20 km wide) and evidence for significant erosion at their base indicate that these may be palaeovalleys rather than distributive channels (Fig. 18). The stratigraphy may thus be responding to external forcing by changes in sea level, with falls in sea level driving shelf incision and the cutting of incised valleys. This is important for understanding the turbidites down dip; the evidence from the deltas suggests that there were times when much of the sediment was held in shallow water shoal deltas and estuaries, and other times when either deltas migrated to the shelf edge or the shelf itself was incised and rivers fed sediment directly to the top of the slope. These latter two scenarios would have favored transfer of sediment into deeper water. Fig. 19 The Clare Group at Spanish Point. • Initial sediment supply was mainly from the southwest, probably from deltas in a shelf edge position or rivers incised right across the shelf. • There was a low tidal range, significant wave influence but possibly brackish water on account of high river discharge into a humid tropical basin remote from, or poorly connected with the ocean. • The area was tectonically relatively quiescent, with the basin geometry largely inherited from an earlier stretching event. • The ‘big picture’ is one of overall progradation and shallowing through time, such that deeper basinal shales are overlain by turbidites and then slope deposits and finally the shelf/delta deposits. • High frequency (probably glacioeustatic) changes in relative sea level and sediment flux occurred throughout deposition. The Deepwater Gallery is a complete index to photographs of the geology of Co Clare. Braithwaite, K., 1993, Stratigraphy of a mid-Carboniferous section at Inishcorker, Ireland: Annales de la Societe Geologique de Belgique, p. 116, p. 209-219. Brennand, R. P., 1965, The Upper Carboniferous (Namurian) stratigraphy north-east of Castleisland, County Kerry, Ireland: Proceedings of the Royal Irish Academy, v. 64, sect. B, p. 41-63. Caputo, M. V., and J. C. Crowell, 1985, Migration of glacial centers across Gondwana during Paleozoic Era: Geological Society of America Bulletin, v. 96, p. 1020-1036. Chapin, M.A., Davies, P., Gibson, J.L. & Pettingill, H.S. (1994), Reservoir architecture of turbidite sheet sandstones in laterally extensive outcrops, Ross Formation, western Ireland. In Weimer, P., Bouma, A.H. & Perkins, R.F (eds), Submarine fans and turbidite systems, GCSSEPM 15th Annual Research Conference, 53-68. Coller, D.W., 1984, Variscan structures in Upper Palaeozoic rocks of west central Ireland, in D.H.W. Hutton and D.J. Sanderson, eds., Variscan Tectonics of the North Atlantic region: Special Publication of the Geological Society of London no. 14, p. 185-194. Collinson, J.D., Martinsen, O. Bakken, B. and Kloster, A. (1991), Early fill of the western Irish Namurian Basin: a complex relationship between turbidites and deltas. Basin Research, 3, 223-242. Croker, P. F., 1995, The Clare Basin: a geological and geophysical outline, in P.F. Croker, and P.M. Shannon, eds., The petroleum geology of Ireland’s offshore basins: Geological Society of London Special Publication no. 93, p. 327-339. Crowley, T. J., and S. K. Baum, 1994, General Circulation model study of the Late Carboniferous interglacial climates: Palaeoclimates, v. 1, p. 3-21. Davies, S.J. & Elliott, T. (1996), Spectral gamma ray characterisation of Hodson, F. & Lewarne, G.C. (1961) A mid-Carboniferous (Namurian) Basin in parts of the counties of Limerick and Clare, Ireland. Quart. Geol. Soc. Lond., 117, 307-333. Gill, W. D., and Kuenen, P. H. 1958, Syndepositional sliding and slumping in the West Clare Namurian Basin, Ireland. Geol. Surv. Irel., Spec. Pub. 4, 1-121. Hodson, F., 1954a, The beds above the Carboniferous limestone in north-west County Clare, Eire: Quarterly Journal of the Geological Society of London, v. 109, p. 259-283. Hodson, F., 1954b, The Carboniferous rocks of Foynes Island, County Limerick: Geological Magazine, no. 2, p. 153-160. Hodson, F. & Lewarne, G.C. (1961) A mid-Carboniferous (Namurian) Basin in parts of the counties of Limerick and Clare, Ireland. Quart. Geol. Soc. Lond., 117, 307-333. Holland C. H., 1981, A geology of Ireland: Scottish Academic Press, Edinburgh, 335 p.
Leeder, M. R., 1976, Sedimentary facies and the origins of basin subsidence along the northern margin of the supposed Hercynian Ocean: Tectonophysics, v. 36, p. 167-179. Leeder, M. R., 1982, Upper Paleozoic Basin of the British Isle—Caledonian inheritance versus Hercynian plate margin processes: Journal of the Geological Society of London, v. 139, p. 79-491. Leeder, M. R., 1988, Recent developments in Carboniferous geology: a critical review with implications for the British Isles and north-west Europe: Proceedings of the Geological Association, v. 99, p. 73- 100. Lees, A., 1961, The Waulsortian “reefs” of Eire; a carbonate mudbank complex of lower Carboniferous age: Journal of Geology, v. 69, p. 101-109. Lien, T., R. G. Walker, and O. J. Martinsen, 2003, Turbidites in the Upper Carboniferous Ross Formation, western Ireland: reconstruction of a channel and spillover system: Sedimentology, v. 50, p. 113-148. Martinsen, O.J. (1989), Styles of soft sediment deformation on a Namurian (Carboniferous) delta slope, western Ireland Namurian Basin, Ireland. In Whatley, M.K.G. & Pickering, K.T. (eds) Deltas: sites and traps for fossil fuels, Geological Society Special Publication, 41, 167-177. Martinsen, O.J. & Bakken, B. (1990), Extensional and compressional zones in slumps and slides in the Namurian of County Clare, Ireland. Journal of the Geological Society, 147, 153-164. Martinsen, O. J., T. Lien, and R. G. Walker, 2000, Upper Carboniferous deep water sediments, western Ireland: analogues for passive margin turbidite plays, in P. Weimer, R. M. Slatt, J. Coleman, N. C. Rossen, H. Nelson, A. H. Bouma, M. J. Styzen, and D. T. Lawrence, eds., Deep-water reservoirs of the world, Gulf Coast Section-SEPM Special Publication, p. 533-555. Martinsen, O. J., and J. D. Collinson, 2002, The Western Irish Namurian Basin reassessed—a discussion: Basin Research, v. 14, p. 523-542. McKerrow, W. S., and N. J. Soper, 1989, The Iapetus suture in the British Isles: Geological Magazine, v. 126, p. 1-8. Menning, M., D. Weyer, G. Drozdzewski, H. W. J. Van Amerom, and I Wendt, 2000, A Carboniferous Time Scale 2000: Discussion and use of geological parameters as time indicators from central and western Europe: Geologisches Jahrbuch, r. A, h. 156, p. 3-44. Morton, W. H., 1965, The Carboniferous stratigraphy of the area north-west of Newmarket, Co. Cork, Ireland: Scientific Proceedings of the Royal Dublin Society, v. 2A, p. 47-64. Ordnance Survey of Ireland, 2001, Discovery Series no 63, County Clare and County Kerry, 2nd edition, 1:50000. Phillips, W. E. A., C. J. Stillman, and T. Murphy, 1976, A Caledonian plate tectonic model: Journal of the Geological Society of London, v. 132, p. 579-609. Philcox, M. E., 1961, Namurian shales near Buttevant, north County Cork: Scientific Proceedings of the Royal Dublin Society, v. A, no. 1, p. 205-209. Pulham, A.J. (1987), Depositional and syn-sedimentary deformation processes in Namurian deltaic sequences of west County Clare, Ireland. Unpublished PhD thesis, University of Wales, Swansea. Pulham, A.J. (1989), Controls on internal structure and architecture of sandstone bodies within Upper carboniferous fluvial-dominated deltas, County Clare, western Ireland. In Whatley, M.K.G. & Pickering, K.T. (eds) Deltas: sites and traps for fossil fuels, Geological Society Special Publication, 41, 179-203. Pyles, D. R., 2004, On the stratigraphic evolution of a structurally confined submarine fan, Carboniferous Ross Sandstone, western Ireland: unpublished PhD dissertation, University of Colorado at Boulder, 322p. Pyles, D.R., 2007, architectural elements in a ponded submarine fan, Carboniferous Ross Sandstone, western Ireland, in T. H. Nilsen, R.D. Shew, G.S. Steffens, J.R.J. 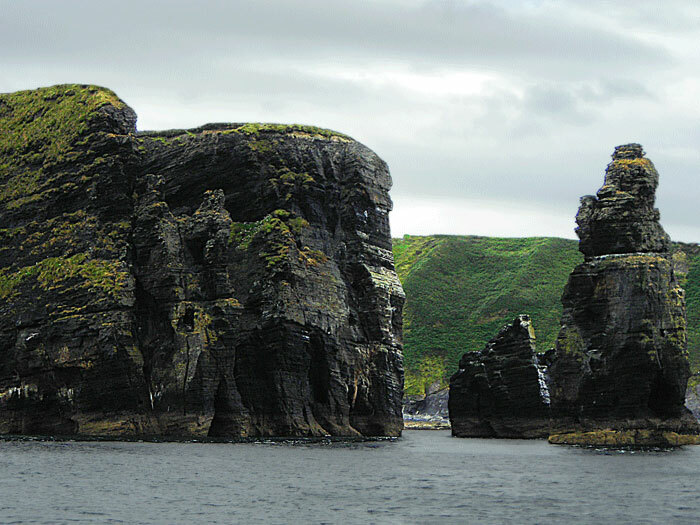 Studlick, Atlas of Deepwater Outcrops: AAPG Studies in Geology 56, CD-ROM, 19 p.
Pyles, D.R., 2008, Multiscale stratigraphic analysis of a structurally confined submarine fan, Carboniferous Ross Sandstone, Ireland: AAPG Bulletin, v. 92, p. 557-587. Pyles, D.R., Reply, 2009, Multiscale stratigraphic analysis of a structurally confined submarine fan, Carboniferous Ross Sandstone, Ireland: AAPG Bulletin, v. 93, p. 1710-1721. Pyles, D.R., and D. Jennette, 2009, Process and facies associations in basin-margin strata of structurally confined submarine fans: Example from the Carboniferous Ross Sandstone (Ireland): Marine and Petroleum Geology, v. 29, p. 1974-1996. Ramsbottom, W. H. C., M. Calver, R. M. C. Eagar, F. Hodson, D. W. Holliday, C. J. Stubblefield, and R. B. Wilson, 1978, A correlation of Silesian Rocks in the British Isles: Special Report of the Geological Society of London, no. 10, 81 p.
Rider, M.H. (1969), Sedimentological studies in the West Clare Namurian Basin, Ireland and the Mississippi Delta. Unpublished PhD thesis, Imperial College London. Rider, M.H. (1974), The Namurian of West County Clare. Proceedings of the Royal Irish Academy, 74B, 125-142. Rider, M.H. (1978), Growth faults in the Carboniferous of western Ireland. Bulletin of the American Association of Petroleum Geologists, 62, 2191-2213. Riley, N. J., J. Claoue-Long, A. C. Higgins, B. Owens, A. Spears, L. Taylor, and W. J. Varker, 1993, Geochronometry and geochemistry of the European Mid-Carboniferous boundary global stratotype proposal, Stonehead Beck, North Yorkshire, UK: Annales de la Societe Geologique de Belgique, v. 116, p. 275-289. Sevastopulo, G. D., 1981a, Lower Carboniferous, in Holland, C.H. ed., A geology of Ireland: Scottish Academic Press, Edinburgh, p. 147-172. Sevastopulo, G. D., 1981b, Upper Carboniferous, in Holland, C.H. ed., A geology of Ireland: Scottish Academic Press, Edinburgh, p. 173-199. Soper, N. J., B. C. Webb, and N. H. Woodcock, 1987, Late Caledonian (Acadian) transpression in northwest England: timing, geometry and geotectonic significance: Proceedings of the Yorkshire Geological Association, v. 46, part 3, p. 175-192. Strachan, L. J., 2002, Slump-initiated and controlled syndepositional sandstone remobilization: an example from the Namurian of County Clare, Ireland: Sedimentology, v. 49, p. 25-41. Strogen, P., 1988, The Carboniferous lithostratigraphy of southeast County Limerick, Ireland, and the origin of the Shannon trough: Geological Journal, v. 23, p. 121-137. Strogen, P., I. D. Somerville, N. A. H. Pickard, G. Jones, and M. Fleming, 1996, Controls on ramp, platform and basinal sedimentation in the Dinantian of the Dublin Basin and Shannon Trough, Ireland, in P. Strogen, I. D. Somerville, and G. Jones, eds., Recent advances in Lower Carboniferous Geology: Geological Society of London Special Publication no. 107, p. 263-279. Tate, M. P. and M. R. Dobson, 1989, Pre-Mesozoic geology of the western and north-western Irish continental shelf: Journal of the Geological Society of London, v. 146, p. 229-240. Tate, M. P., 1993, Structural framework and tectono-stratigraphic evolution of the Porcupine Seabight Basin, offshore western Ireland: Marine and Petroleum Geology, v. 10, p. 95-123. Toniolo, H., M. Lamb, and G. Parker, 2006, Depositional turbidity currents in diapiric minibasins, on the continental slope: Formulation and theory: Journal of Sedimentary Research, v. 76, p. 783-797. Veevers, J. J., and C. Mc A. Powell, 1987, Late Paleozoic glacial episodes in Gondwanaland reflected in transgressive-regressive depositional sequences in Euramerica: Geological Society of America Bulletin, v. 98, p. 475-487. Wanless, H. R., and F. P. Shepard, 1936,; Sea level and climate changes related to Late Paleozoic cycles: Geological Society of America Bulletin, v. 47, p. 1177-1206. Wignall, P.B. and Best, J.L. (2000), The Western Irish Namurian Basin reassessed. Basin Research 12, 59-78. Wignall, P.B. and Best, J.L. (2002), The Western Irish Namurian Basin reassessed – a discussion. Basin Research 14, 523-542.